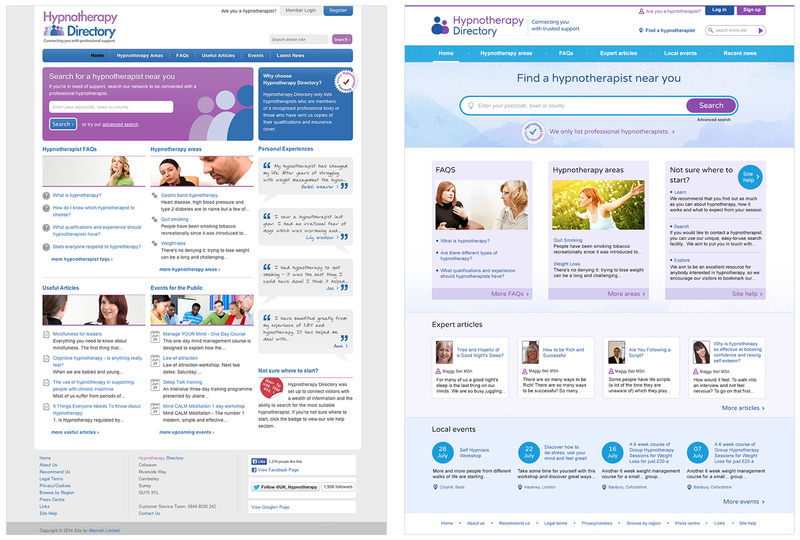 Hypnotherapy Directory has re-launched, and now has an exciting range of new features designed to make it easier for you to connect with trusted support. With the aim of enhancing navigation and usability, our website has been refreshed to bring you a cleaner, simpler and more up-to-date resource for all your hypnotherapy needs. A fixed ‘Search for a hypnotherapist’ toolbox on every page. Quick and easy to use ‘Save profile’ button – and you can access your saved profiles on every page. A mini search tool for local events to help narrow down your search. Changes to our social media pages and better integration with Facebook, Twitter and Google Plus activity. ‘We love feedback’ tab – for you to share your thoughts and tell us how we’re doing. Email the team at digital@hypnotherapy-directory.org.uk and we’ll get back to you as soon as possible.